Nakazen Shuzo Sake Brewery aims to brew rich, flavorful sake that is not influenced by trends and soothes the soul with a balanced blend of flavors and aromas that are not overpowering. Protecting and devoted to the mountains. During the Edo period, woodcutters cut trees in the deep Kiso Mountains and it is said that the logs were transported to the Owari Domain by floating them one by one, down the narrow and fast running Kiso River. The person riding on top of the log to control it as it flowed was called “Nakanorisan.” They risked their lives in this dangerous ride down the Kiso River and were considered the supermen of their time. Just like the Nakanorisans risked their lives to carefully transport each log down the river, we also transform the care of our rice farmers and others involved in the sake production into flavor, and deliver each sake bottle to our customers with sincerity. All the rice used for sake brewery at Nakazen Shuzo is produced in Nagano Prefecture. Nakazen Shuzo’s Junmai-shu (sake made without added alcohol or sugar) is certified by the Nagano Appellation Control Committee. The Nagano Appellation Control System is a system that certifies certain products produced and manufactured in Nagano Prefecture that are exceptional in flavor and quality. Only those products that pass strict standards screened by the committee which consists of farmers, consumers and people related to the distribution industry, will receive certification. Since 2008, Nakazen Shuzo started cultivating its own rice (the “Hitogokochi” rice brand, suited for sake brewing) in Agematsu, a town adjacent to its location, and succeeded in brewing sake using “locally produced homegrown rice,” which was the purpose of this endeavor. Since sunshine duration in Kiso is short, it is not really an ideal location for cultivating rice. However, even in Kiso, the Yoshino district in Agematsu Town thrives with agriculture as clear, snowmelted water from Mt. Kiso Komagatake is abundant and available for the rice paddies. 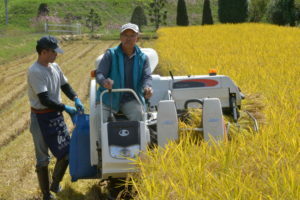 The Miyamanishiki rice grown by representative Maruyama of Farm Ichimaru in Azumino, which is known as one of the best areas for the production of Miyamanishiki in Nagano Prefecture, uses snow-melted water from the Japan Alps, and has been studied and cultivated using an original blend of fertilizers. Using the large and evenly grained Miyamanishiki rice, grown by farmers with much care and effort, Nakazen Shuzo brews sake that utilizes and maximizes the best qualities of this brand of rice. The hometown of the sake brand “Nakanorisan” is Kiso, which is a mountainous region surrounded by Mt. Kiso Ontakesan and Mt.Kiso Komagatake. Fresh water and clean air, extremely cold winters and cool summer breezes, the mountains change their expressions from season to season. As the winters are especially bitter cold, episodes unique to cold regions are abound such as beer bottles freezing and bursting at liquor stores and using refrigerators as storage space so items do not freeze. People on the Nakasendo trail (Edo-period trail between Edo and Kyoto) traveled from one lodge to another with the help of ichirizukas (distance markers for one ri, about 3.9km). Kisoji, the Kiso road section of this Nakasendo trail is known to be an especially dangerous area as this trail crosses over a treacherous mountain pass along the Kiso River, goes through a deep valley, crosses a cliff and extends as if it were crawling along the foot of the mountain. In the past, people making pilgrimages to Ise Shrine and Zenko-ji Temple came and went along this road as well as Daimyos and Samurai who were traveling to perform their sankin-kotai (alternate residence duties), and haiku poets Basho Matsuo and Shiki Masaoka trekked the trail as they composed their seasonal poems. Nakanorisan must have been a welcoming and comforting sake to such travelers. 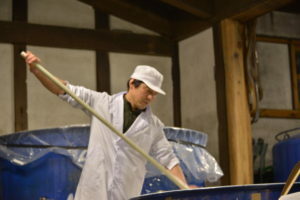 Nakazen Shuzo continues to develop and enhance its sake by succeeding the brewery method of chief brewer Yamaguchi, who has 20 years’ experience in sake brewery. 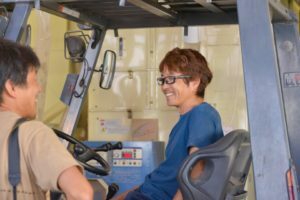 This method, based on the basics with fine attention to details, is also infused with the sensitivities of the workers in their 40’s who are at the prime of their life.